I have finally decided to get into gear on my fieldfare and redwing picture which has been sitting forlornly in the “On The Easel” section of this blog for some time now. 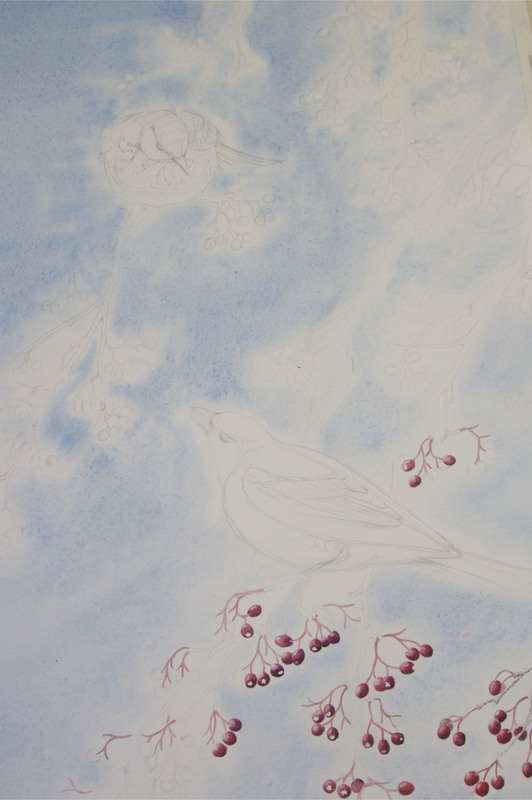 As it is going to be such a large work and will take quite some time to complete I decided to paint a smaller piece depicting fieldfares and whitethorn berries to iron out any problems I might have with the larger piece. Problem is I am gone half mad already painting berries and there are still soooooo many to do! I shall work on them for another few hours this morning and begin the birds on Monday. Check out the “on The Easel” page for progress on this painting. This picture is quite large in itself measuring 350mm x 550mm. Thanks a million for your kind offer! I will stop painting berries immediately. I will do everything else and let you complete the berries. Perhaps you could do some practicing with your lipstick, a nice vermillion shade would be great!